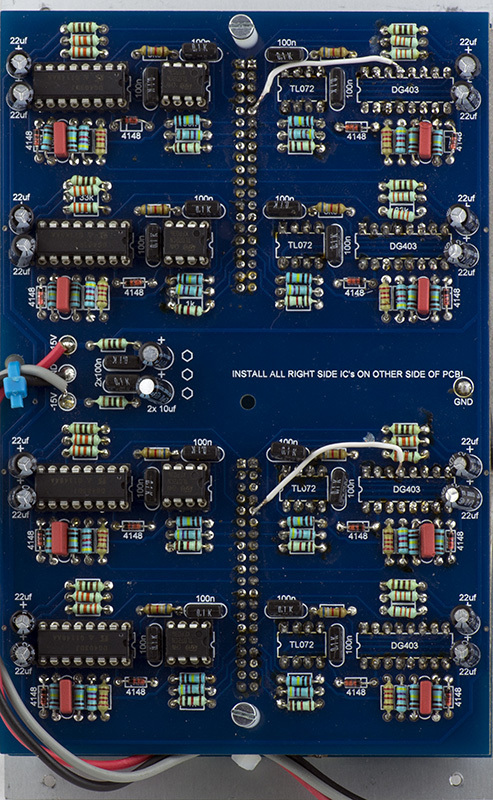 I was sent a a Buchla format 402 Quad Dual LFO module to repair. I've never seen one of these before and there is very little information on the web. I don't even know who the logos on the panel are for. Two of the LFOs (right side B and D) had significantly faster rates and had other issues at the lowest frequency. The design is very symmetrical as can be seen on the PCB rear. I determined that the 22 uF capacitors for two bad oscillators had no +15V connected to them so this was a PCB design issue. I don't know who did this design but suspect that there were modifications needed that were never made by the builder. What was amazing is the waveform would morph from a nice triangle to a very nice rail to rail sine wave at the lower frequencies. The other interesting aspect of this module is that the right side panel is a mirror image including the controls. They operate with the opposite rotation so in the above image all eight LFOs are set to the same shape and rate. I didn't take a lot of scope images as the module simply outputs 8 triangle waveforms. I did verify all eight LFOs operated with the same range. 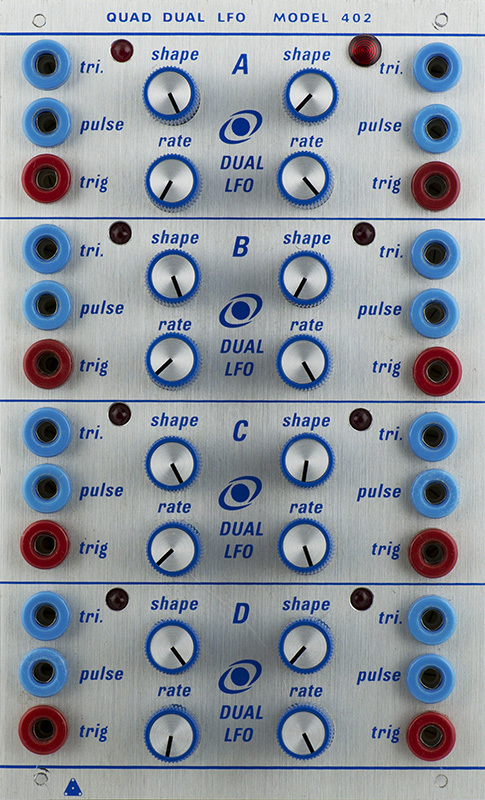 This scope image shows the four right LFO outputs at their slowest setting. 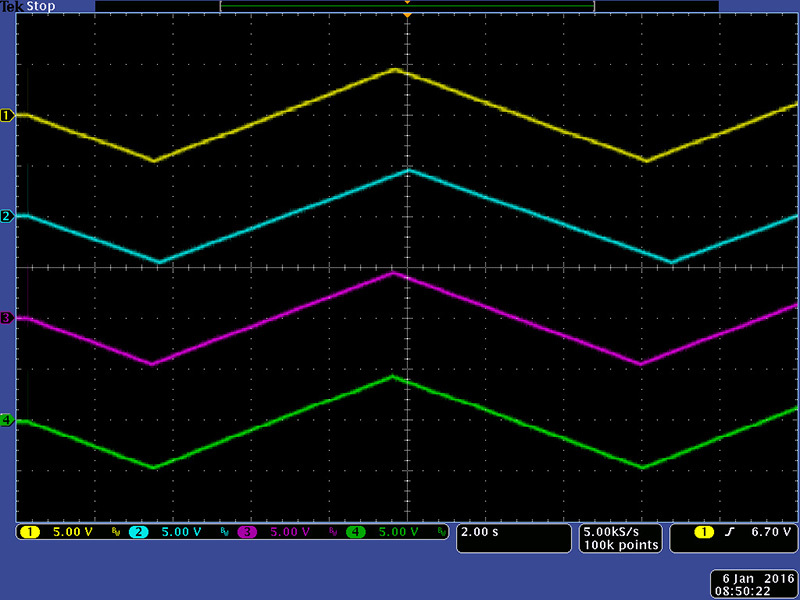 The glitch on the very left is power-on which is how I synchronized the four oscillators to compare their cycle. At the lowest frequency the cycle is about 12.5 seconds, or 0.08 Hz.